Ayurveda is the first known complete medical science of life known to mankind. Word "Ayu" sense the life, and word "Veda" sense Knowledge. Considered by many scholars to be the oldest healing science, Ayurveda is a holistic approach to health that is designed to help people live long, healthy, and well-balanced lives. Ayurveda has been practiced in India for at least 5,000 years and has recently become popular in Western cultures. The basic principle of Ayurveda is to prevent and treat illness by maintaining balance in the body, mind, and consciousness through proper drinking, diet, and lifestyle, as well as herbal remedies. Ayurveda teaches respect for nature, appreciation of life and the means to empower the individual. It is holistic medicine at its best. According to Ayurveda each individual is unique, a combination of physical, mental & emotional characteristics which are known as his/her constitution (Prakriti). Many factors, both internal as well as external can affect this constitution e.g. one’s emotional state, diet, daily food choices, season and weather, physical trauma, job and family relationships. Once we understand that these factors can cause an imbalance in our constitution we have a choice to take appropriate action to nullify or minimise their effects to eliminate the cause. The term Ayurveda is used today as a generic term for Indian traditional medicine. Ayurveda is a complete medical system, it deals with health in all its aspects; physical health, mental balance, spiritual well-being, social welfare, environmental considerations, dietary and lifestyle habits, daily living trends, and seasonal variations in lifestyle, as well as treating and managing specific diseases. Ayurveda Medicinal science teaches whole information of the entire lifecycle of a single starting since conception to decease. Ayurvedic holistic science is founded upon observation of living things and their real reaction and their responses to their atmosphere. It contracts with numerous features of lifetime. It incorporates not solitary remedial method but also contracts in good particulars about the spiritualism and attitude. Supplementary than a therapeutic method, Ayurveda is a mode of life, a technique of collaborating with environment and existing in agreement with nature. It considers that individual being is a quantity of environment and whatsoever lies in environment, there is a matching image of parallel elements in the body too. Hence individual has to continuously aware in harmony with environment and one must never attempt to drive against environment. We are fortunate informed with the penalties, which we are suffering if we attempt to go anti the rules of nature. Ayurveda is mostly used all around the planet in several arrangements. Numerous home-based remedies are used for the healing of minimal and major health issues. But the possibility of Ayurveda does not boundary the situation to these minimal home-based solutions. For a effective Ayurveda treatment an Ayurvedic doctor thinks individual being as a complete and does not account the parts of the physique as lonely tissues for the purposefulness of whichever understanding or for cure of illnesses. Body, Mind and Soul are well-thought-out as vital fundamentals for interconnection of all ailments. So similar while healing also all these dynamics have to be studied. The maladies are triggered by disruption in the symmetry of primary body forces /Doshas that are traveling all over the body. Rendering to Ayurveda science, each individual comprises certain of the cosmos's five essential fundamentals: earth, air, fire, water and ether. The mixture of these fundamentals in every person breakdowns into three funtional body types, or ayurveda doshas, known as vata, pitta and kapha. The philosophy behindhand Ayurveda states that illness is began by an inequity or imbalance in the doshas, subsequent in poisonousness in the body and brain. Ayurveda not only cures precise wellbeing worries but too proposals clarification as to why one individual reacts contrarily to another. Ayurveda itself is a complete healing knowledge that can be functional to each action in lifetime. To Learns more about Ayurveda or to avail any Ayurveda Treatments visit Pure Herbal Ayurved Clinic. 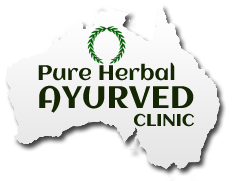 Our Ayurveda doctors are among the most distinguished Ayurveda Practitioners in Melbourne, Australia.